Every Salon Should Have Cool Care Heat Protectors and Decorated Mini Flat Irons! 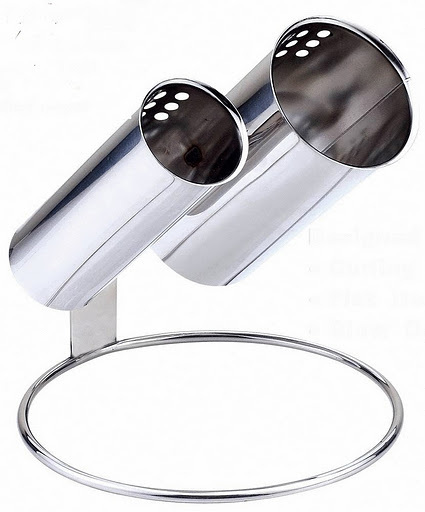 Cool Care® Heat Protectors give Salons protection from heat and clutter. Cool Care® Heat Protectors are 100% Stainless Steel with top openings to help cool down your hair tools and will protect you or a child’s skin from harm’s way. These holders have a LIFETIME GUARANTEE and are machine washable! AND BEST OF ALL they are a great way to organize your hair tools and keep your area neat! Cool Care® offers both wall-mountable and table top options. 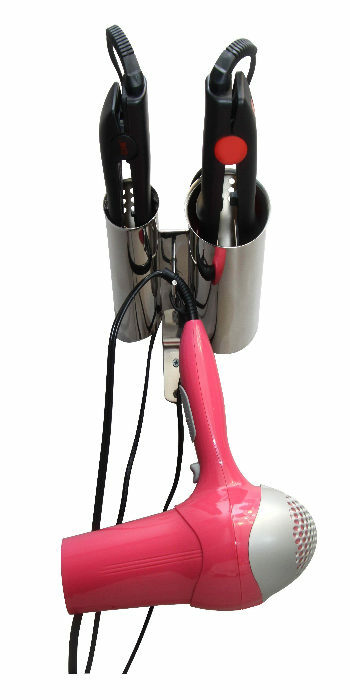 There are two wall-mountable models (directions, inserts, and mounting screws included) that safely hold two hot curling irons with a hook for a blow dryer located underneath for easy access. All models of COOLCARE® Have the PTPA (Parent Tested Parent Approved) Seal of Approval! The Wall Mountable option is available for $29.99 + $9.50 shipping at http://americanbeauty.ws Credit Cards and Paypal accepted. The Table top Cool Care® model is GUARANTEED NOT TO TIP OVER even with the largest of curling irons and comes already assembled – you don’t have to put it together and you can take it with you wherever you go! All models of COOLCARE® Have the PTPA (Parent Tested Parent Approved) Seal of Approval! The Table top option is available for $34.99 + $9.50 Shipping at http://americanbeauty.ws Credit Cards and Paypal accepted. 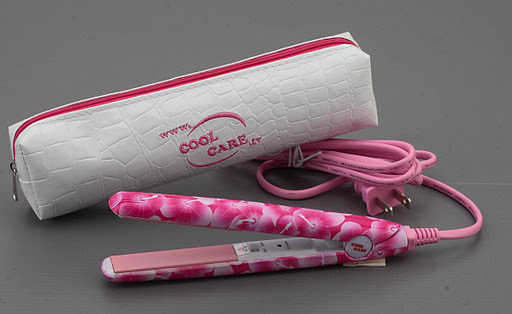 The Decorated Cool Care® Mini Flat Iron comes in a playful pink and white print and comes with a matching Pink Storage Bag. This mini size flat iron is also known as a “Detailer” in the world of hair styling and is perfect for bangs, shorter layers, and getting close to the hair root. The Cool Care® mini flat iron features ceramic plates and heats up to 200 degrees Celsius in 1 minute! It’s small enough to become a staple item in your purse. All models of COOLCARE® Have the PTPA (Parent Tested Parent Approved) Seal of Approval! The Mini Flat Iron is available for $19.95 + $5.95 Shipping at http://americanbeauty.ws Credit Cards and Paypal accepted.